Astronomer: Pluto should get planet status again, previous de-listing “sloppy” | Watts Up With That? “We now have a list of well over 100 recent examples of planetary scientists using the word planet in a way that violates the IAU definition, but they are doing it because it’s functionally useful,” he says. Before joining UCF, Metzger worked at NASA’s Kennedy Space Center from 1985 to 2014. He earned both his master’s (2000) and doctoral (2005) degrees in physics from UCF. Okay Pluto can have its status back, but only if it promises to behave this time. I told it to stay away from “progressives” like Tyson. Once it is rightfully restored to planetary status, maybe it will listen this time. It is still a planet, just a dwarf planet. No one says you’re not allowed to study it , so what’s the BS about it being “left out”? In fact the real reason behind the reclassification was that mainstream astronomers have been slating claims of a tenth planet for so long but are slowly starting to realise there may actually be one. Rather than have to lose face, they demoted Pluto so that they can discover the 9th planet for a second time instead of admitting there is a planet X. Might not be PC…. Perhaps little planet works better these days? The Earth is 107 Sun diameters out from the Sun, a staggering figure by itself. So far that it is utterly unaffected by heat from the Earth! Up up up!!! If I’d have been sipping hot coffee when I read that, I might have been injured. Hmmmmm…. Scientists arguing about science. Why can’t they all agree? Achieve con-sensus? It’s so unsettling! Taxonomy in biology long has been a fertile field for arguments. So it shall be for planetary science because Nature mocks human categories. It’s not science, it’s terminology. Arbitrary and not very meaningful. Definitions matter. It’s how we communicate effectively. Without them there could be no common understandings. The internal complexity of a planetary body has nothing to do whatever with its orbital profile, or to which planetary system it belongs. My Grandmother is a very complex woman, but no matter how complex she becomes she still isn’t my sister. The natural world cares not a whit for our classifications, but we do otherwise we are talking past each other. Definitions matter. It’s how we communicate effectively. effective communication is not helped by changing definitions. Pluto, for decades, was a planet. Now it’s not due to an arbitrary change in definition designed to demote Pluto from planet status. How is that effective for communication? It’s not arbitrary. The definition was changed because we learned more about Pluto and the Kuiper Belt. This new info required a rethink about what “planet” ought to mean. If every spherical body in the solar system, and other star systems, be a “planet”, then why not just call them “spheres”? The Earth-Moon system then becomes a simple “two-sphere” or “binary-sphere” system. no! you can’t make us obey your BINARY SPHERE labeling! The Earth and moon are Non-binary, gender fluid thingamabobs! So….if the Earth and Moon were binary, they’d be “thingamaboobs”? And the definition also excludes any object not orbiting the Sun, so all of those exo-planets must just be asteroids or something. But it gets even better. I can’t wait until the heads explode when Planet X (or nine as some are calling it) is found. Based on the disturbances in the outer solar system, the estimates are that there’s another Neptune (10 Earth masses) out there, but it won’t have “cleared it’s orbital neighborhood” so a body orbiting the Sun with 10 times the mass of Earth will have to be called a “dwarf planet.” Right? Neil deGas will be along shortly to explain how that’s different, of course. Earth-Moon is a borderline double planet. Why wouldn’t it have cleared its neighborhood? Probably because its neighborhood is a bit different than ours. It’s orbit is rather eccentric (elliptical) and at its closest is closer to the sun than Neptune during part of Pluto’s ‘year’. I’ll bet it gets down right balmy then. Back in 1979 Pluto was actually at that time the 8th planet from the sun ( it hadn’t been demoted as yet). Its orbit is also tilted from the ecliptic, which means its orbit is a completely different plane than the others. Nobody else was clearing that plane so poor old Pluto had to sweep what it could all alone in its neighborhood. rocket; I believe Neptune is also turned on it’s side. Not tilt-aligned with the majority of planets in the system. Does it then loose it’s planet status? That’s Uranus, not Neptune. Tilt isn’t one of the IAU’s three planetary criteria. And what about rogue planets? Planets that got ejected from their solar system for some reason, and are now wandering space freely. The criteria were established for the solar system and other star systems. When we find dwarf rogue planets, the IAU can make up its collective mind then. Those we found so far have been large to giant. For those which have formed in interstellar space, ie without being ejected from a star or brown dwarf system, the IAU has proposed the name “sub-brown dwarf”. IMO unprofessional opinion, rogue or nomad planets which have been ejected from star systems should be considered planets, unless they’re smaller than Neptunian moon Triton, which is larger than Pluto and appears to have once been a Kuiper Belt dwarf planet captured by Neptune. Then the nomad would be a dwarf rogue planet. Yes it was an arbitrary change in definition – designed to eliminate Pluto from planetary status. There was nothing wrong with the previous definition that included Pluto, so changing it was entirely arbitrary. College stunt, organized and done because they could. A feather in the cap of a dandy. The definition was clear. 1) Orbit a star 2) large enough to be spheroid. The new definition is difficult and ambiguous. It WAS designed to demote Pluto. Until we know there are Kuiper objects that are spheroid, the concern of dozens or hundreds of new planets isn’t even a true concern. What is this “promote/demote” stuff? Whether we call Pluto a planet, dwarf planet, or KBO has nothing to do with it’s “value”. Pluto doesn’t care what we call it. When Tombaugh found Pluto, he saw the first of an entirely new class of object. But, like many discoverers, he didn’t fully understand what he had just discovered. That’s way cooler than just finding another boring old planet. Be nice if they were. According to the OP, the actual criterion for being a full fledged planet is a criterion that NO planet in the solar could meet. The eight planets do meet the three criteria established by the IAU. You mean the three arbitrary criteria established to eliminate the ninth planet (pluto). According to Metzger, none of the planets have cleared their orbit. There are still NEO that cross earth’s path every day. That’s Right!!! We Love Pluto!!! Holy semantics batman. Maybe Astronomers need to agree on a definition. Technically the only planet with “Geology” is Earth, by definition. I think this is one of those pedantic arguments that will never end.
. . . I still blame Neil deGrasse Tyson. Tyson and company's goal was to demote Pluto from its planetary status. However, they were sloppy in their definitions. They forgot about Trojan asteroids. These objects orbit with their primary in Lagrangian points L4 and L5. That means that Jupiter, Earth, Mars, Venus, Saturn, Neptune, and Uranus aren't technically planets either–they didn't completely clear out their orbits. Much as I dislike Tyson, IMO the IAU’s definition is valid. The definition doesn’t mean that there can be no other object in a planet’s orbit, but those that are must be gravitationally bound to the primary. This includes both moons and Trojans. IMO, had Pluto been found in 1980 rather than 1930, it would not have been considered a planet, since it’s so small. Clyde Tombaugh couldn’t distinguish Pluto from its large moon Charon, so it looked much bigger than it really is. Its orbit and composition are more comet-like than planetary. No one knows how many Pluto-like objects there might be in the Kuiper Belt and beyond. If there are thousands of planets, then the term becomes meaningless. This has been a great summer for watching real planets. It’s been kind of sad to see Mars (made even redder by its planetary storm) receding this month. Why not then call all bearings “ball bearings”, whether they be other types of rolling-element bearings; plain bearings, to include bushing, journal, sleeve, rifle or composite bearings; jewel bearings; fluid bearings; magnetic bearings, or flexure bearings? Why not call all volcanoes stratovolcanoes? Why not call all circus performers clowns? Not all spherical celestial objects are planets. Do stars and brown dwarfs count? If asteroids, moons, dwarf planets, Kuiber Belt objects and, presumably some Oort Cloud bodies, are all planets, what does the term mean, other than “spheres”? “Planet” imparts more information about a body than merely its shape. Or call all mountains volcanoes. IMO, the distinction between moon and planet is valid, meaningful and useful. Ditto between dwarf and true planets. There are more than just thousands of so called “scientists”. Scientist, non-scientist: what difference does it make? There are thousands of terms ……..
as a supporter of the IAU definition, in what sense are there rogue planets, planets without any orbits found between planetary systems. This is not a criticism of your argument above, but a serious question of something that seems to be overlooked by the IAU definition. I considered mentioning “rogue planets”, planetary-sized bodies orbiting the galactic barycenter rather than a star. They could be given their own category, like dwarf planets, or the definition could be changed by eliminating the need to orbit a star. Or say that there are stellar planets and galactic planets. There is also the issue of brown dwarf “stars”, which is similar to the rogue planet problem, with the added issue of what cosntitutes a star. There can be true stars and near stars. But as for the solar system and other star systems, the IAU has IMO arrived at a good definition. And how do we know that Pluto does not meet this criteria? As far as I know, no objects have been spotted in Pluto’s orbit other than those that are gravitationally bound to it. Lots of small, icy objects have been observed in Pluto’s path besides its moons. More importantly, true planet Neptune lies in Pluto’s path. Their orbits cross. Much of the time, Pluto and Neptune’s position relative to the sun is switched. Uh, am I missing something here, or doesn’t that mean the NEPTUNE also hasn’t ‘cleared it’s orbit’? Not only does this rule for planets seem arbitrary, it doesn’t seem to be applied to all the ‘real’ planets. Pluto is not always in Neptune’s path, but Pluto passes through the planet’s system, past its moons and other gravitationally bound bodies. 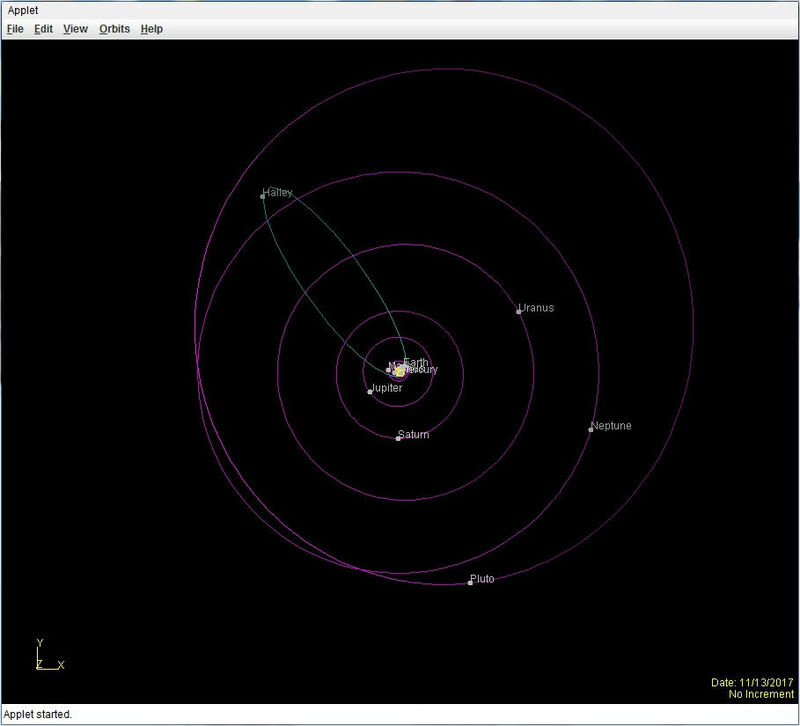 Pluto’s orbit is highly inclined to the plane of the planets. It’s akin to a comet. So Neptune has cleared its neighborhood, but Pluto not its own, which includes objects more massive than itself. Neptune, OTOH, is orders of magnitude more massive than everything else in its path. The rule does apply to Neptune. As noted, there is no agreed upon relative amount of mass to define “clearing the neighborhood”, but there doesn’t need to be, since the difference in this ratio between dwarf and true planets is so enormous. Pluto is not always in Neptune’s path, but Pluto passes through the planet’s system . . . .
No it doesn't. Pluto is actually in gravitational resonance with Neptune. It doesn't actually cross Neptune's orbit. Pluto orbits completely outside of Neptune's orbit. The top-down view is misleading. Thanks for the correction and views. How can a dwarf planet be a planet when it’s in 2:3 orbital resonance with a true planet? None of the eight planets is in orbital resonance with another one. Moons, yes, of course. Apparently probable dwarf planet Orcus also resonates with Neptune in 2:3. In any case, there is relatively far more relative mass in Pluto’s path than in that of any planet. Thanks. Here’s a couple of more images with Eris (assuming I put the orbital parameters for Eris in correctly). This gem should be in every textbook. Including those on ‘climate science’ as an example of proper perspective. Only a small portion of the time are their positions ‘switched’. Only 20 earth years of its 248 earth year long orbit cycle is it closer to the sun than Neptune. Last time that happened it was 1979 to 1999. Next time it will happen will be 2227. 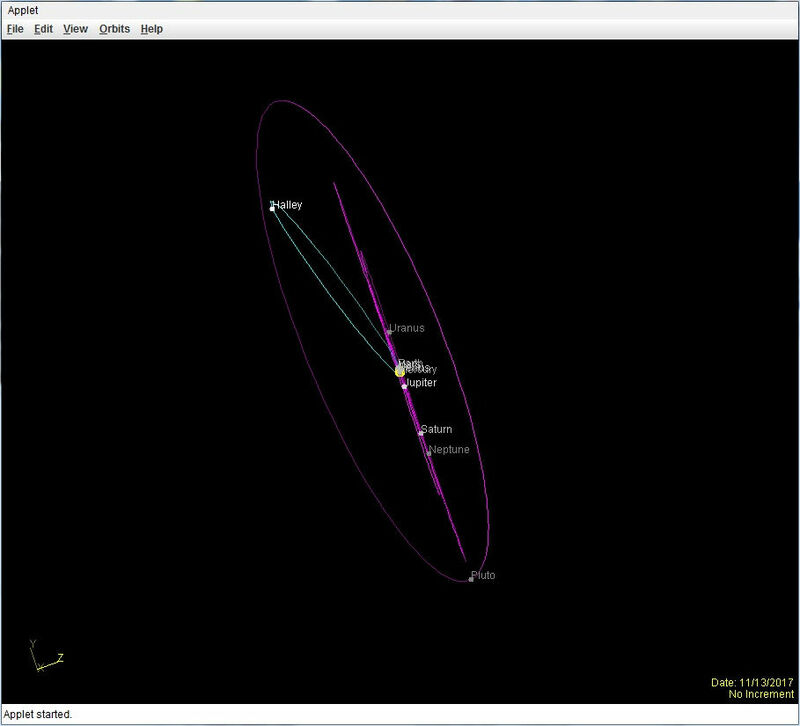 However, more importantly, Pluto’s orbit is in a different plane from Neptune’s (and all the other big 8). That combined with its eccentricity means the two orbital paths never intersect. Knowing that Pluto’s orbit is tilted to the plane of the planets just doesn’t do the trick for a 2-D brain like mine. 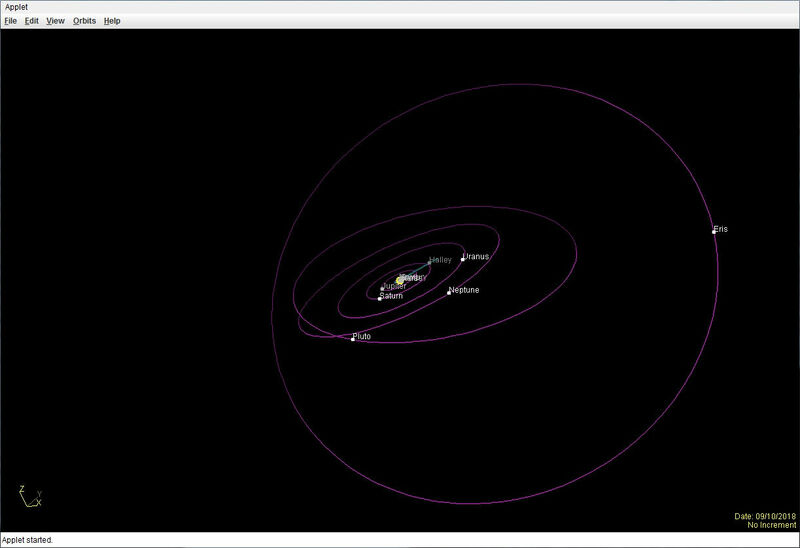 It’s even more fun to move the mouse pointer around and have the solar system rotate before your eyes. The applet uses the Java rotation package–back when they offered it for free. I guess I haven’t entered 21st century astronomy yet. I did in the first decade of this century however play around with software which showed what the skies looked like at various points in the precession cycle, such as which was the pole star. A poor definition, selectively applied, not for the advancement of knowledge or clarity but a conversation starter at cocktail parties – ‘I did that’, in my opinion. And, hmm… Neptune certainly hasn’t cleared Pluto out of its orbital path – nor has it gravitationally bound it. So, I guess we are now down to SEVEN planets. At least by the IAU definition. Neptune has cleared its path, including capturing a dwarf planet even bigger than Pluto, ie its moon Triton. If Pluto ever got near Neptune, it too would be “cleared”, ie gravitaionally captured by the ice giant. Hasn’t happened yet, so it hasn’t “cleared” it yet, therefore Neptune is not a yet planet by that arbitrary definition. We can barely see Pluto with the Hubble Telescope. What are we using to detect those small, icy objects? I don’t believe any objects other than Pluto and its moons have been spotted in Pluto’s orbit. I would be interested to see any information to the contrary. You forget that Pluto was discovered long before the Hubble. But Tombaugh couldn’t distinguish Pluto from its moon Charon. Had he known how small it really is, it would, like Ceres, never have been considered a planet. As for other objects in Pluto’s neighborhood, we know of lots. You forget that we’ve actually sent a probe to Pluto’s neighborhood, New Horizons. As Jim has observed, Pluto orbits the Sun in a 2:3 resonance with Neptune, which means that for every 3 Neptune-orbits Pluto goes around the Sun exactly twice. Thar’s a very stable configuration, and so it’s not surprising that Pluto isn’t the only object that follows such an orbit. In fact there is an entire class of objects, named Plutinos after the largest member (Pluto), all of which are in the 2:3 resonance with Neptune. 3) 28978 Ixion with a diameter of 617 km, also “highly likely” a dwarf planet. 6) About 350 Plutinos are known, but it is estimated that there are millions of them left undiscovered. Spacecraft New Horizons confirmed and showed false various hypotheses about Pluto’s neighborhood. Therefore Neptune isn’t a planet? It’s not just Trojan asteriods. The Earth crashes into stuff all the time, as do all the other planets. They are still in the process of clearing their orbits. Stuff crossing our neighborhood don’t count. But the key factor is the mass of a planet vs. the amount of stuff in its path, vs. that of a dwarf planet. I thought Goofy killed Pluto. Disney controls the Mickey universe. Rather than kill them off I expect an all female version – WiseNotGoofette and Plutina. Pluto isn’t a planet? That’s Daffy. What sort of Mickey Mouse would cut Pluto out? It’s a Minnie planet. Goofy, eh? The demotion of Pluto was the sort of underhanded stitch up by agenda astronomers that would be a credit to the worst malpractice of climate warriors. It was also incredibly stupid because the criteria they conjured up should also exclude and relegate other planets far larger than Pluto to minor object status. It was also dim because it has made a poor impression on the public and looks scientifically poor judgement now that we know Pluto is far from the cold dead uninteresting lump we thought. Time for the overtight pants brigade to live with the untidy truth that planets don’t conform to neat orderly categories but like all nature are inconveniently wayward and unpredictable in their fascinating variety. It was almost out, but they keep dragging it around. I never jumped on the Pluto-is-not-a-planet bandwagon. Pluto IS a planet. That’s my choice, and I’m sticking to it. Cool, the earth is circled by an uninhabitable planet! Planets don’t orbit other planets. Moons orbit planets. That’s one of the rules. Not according the guy in FL! His definition of “planet” includes spherical moons. What if the objects circling each other are the same size? Are they both planets or moons? Or what? Good question. Since the solar system lacks a double or binary planet, the IAU hasn’t officially defined the term. But astronomy recognizes that double or binary planets can exist, ie a binary system where both objects are of planetary mass. What counts as planetary mass is also a bit fungible. What counts as planetary mass is also a bit fungible. Read: whatever we need it to be. Is the sun a hot planet and we are all it’s moons? I guess the thing I never understood was the importance of a label. After all, changing a definition or a label, doesn’t change the existence of what the label is applied to. There are times a label is important. It simplifies discussions to use one, well understood, term. It’s not clear that planet/dwarf planet is a meaningful distinction, or that being spherical, or having cleared it’s orbit is meaningful either. Plus, changing a name everyone is used to (and is in print everywhere) should not be not casually. They made a mistake and should undo it ASAP. They’ll wait until everyone has finished writing their new editions of the textbooks. Need to squeeze that profit center right to the last. Although they may not get into the planet / not-a-planet thing right away. I predict that the next big thing (requiring new textbook editions) will be to “properly” define “moon.” After all, they’re still calling captured asteroids like Deimos and Phobos “moons,” when a “proper” definition will obviously exclude those two chunks of rock. Excluding Mars’ moons would mean you’d have to exclude the seventh largest moon Triton, a dwarf planet captured by Neptune. If the definition of a moon included “large enough to become spheroid”, Triton would still be a moon, and Deimos and Phobos would not. Humanity has always had problem classifying variable objects. Too often they insist on creating neat little boxes which must contain all of a given set of objects. Too often the limitations of the boundaries the use to define each box mean these preclude the neat assignment of every member of the object set to one of the boxes. Humanity then tends to see the problem as the awkward objects not as the criteria they have used to define the boxes. Sometimes it ain’t even those criteria that are the issue but the original act of defining. Biology recognized this yonks ago and dumped Linnaean classification in favour of cladistics. Perhaps astronomy needs to do likewise. See the discussion of the sorites paradox at https://en.wikipedia.org/wiki/Sorites_paradox which is about, for example, how many grains of sand are needed to constitute a heap. A classification system comparable to cladistics isn’t really available for astronomy. Definitely….the vote was a coup against the American planetary scientists by the EU scientists. IWMPB ! Mercoury, Venous, Eoarth, Moars, Joupiter, Satourn, Uranous, Neptoune, and Ploutou. I’m just waiting for one group of Astrophysicists to start labeling the other group “Denier” and claim consensus to silence any debate. Isn’t that the way true Science is done?? You all are missing the point: what does Pluto believe it is? How can a supposed bunch of enlightened, intelligent people here decide a label for someone else? Next thing you know, you’re going to demand there are only two genders and CO2 isn’t the master control for climate! I use almost the same image. Pluto’s status is a topic for the ages… Of course should someone find a large gas giant out there in the Kuiper belt it’s going to make many people jump through hoops trying to defend their decision to reduce Pluto’s status in the first place. Now that would be intellectually entertaining. A large planet in the Kuiper Belt would have cleared its neighborhood. Is Neptune a planet by that definition. It has failed to clear its orbit of Pluto (occasionally). Just as Earth-crossing asteroids aren’t considered to lie in our orbit, neither does Pluto lie in Neptune’s. 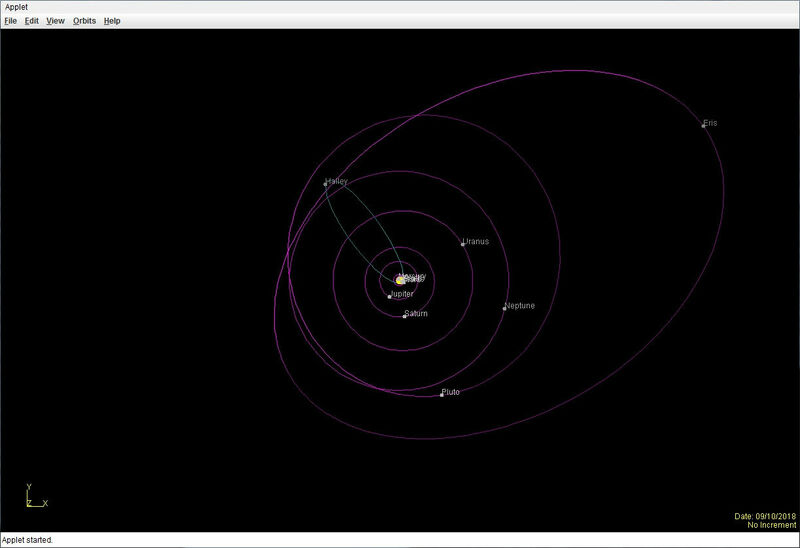 Pluto’s orbit is skewed to the plane of the rest of planetary orbits, like a comet. Should Pluto ever pass close enough to Neptune, it would be captured, as probably was its largest moon, Triton. Pluto’s neighborhood includes not only, at times, Neptune, but the whole Neptunian system, which includes 14 known moons. Its outermost moon, Neso, is the natural satellite orbiting most distant from its planet. Hold on, down below one of your objections to Pluto being a planet was ” Pluto’s orbit crosses Neptune’s” If that’s an objection for Pluto, it’s also an objection for Neptune. You can’t have it both ways. Hasn’t happened yet, therefore Neptune hasn’t yet cleared it’s orbit of Pluto. Neptune therefore is not yet a planet by your own arbitrary definition. Rubbish. There hasn’t been enough time for a body like Neptune to have cleared the entire belt. Not necessarily. The further out a planet is, the larger volume of space in it’s ‘neighborhood’; the longer each orbit is. It takes more time to clear out more volume; it would have experienced much fewer orbits in its history. A large planet in the Kuiper Belt may not have had enough time to clear its neighborhood yet. I put the demotion of Pluto to non-planetary status in the same category as “New Coke”. Seemed like a good idea at the time (to some). I think it’s a category worse – more like open offices. I thought that it was rather stupid to change the status of Pluto when we had not even looked at it, and when we had a probe which was on its way. Talk about making a premature decision. However, I do not favour a definition that would mean that we have dozens and dozens, if not 100 planets in our solar system. That is going from one extreme to the other. Kids at school ought to be able to name the planets and that means that we do not want to have a definition that would include a ridiculous number. This astronomer’s definition would mean thousands of planets in the solar system. And when the probe got there a couple years later, they found the planet (Pluto) to be twice the size of what they expected. I agree 100%; they reclassified what didn’t need to be interfered with, with too little information and no agreed definition. Very sloppy indeed. Jeesh. Who gives a flying you-know-what about whether it’s classified a dwarf planet or a planet. There a dwarf stars and galaxies — why not planets? This seems like a symptom of the current culture — it’s all about labels and identities. Pluto doesn’t give a dang how it’s classified (and can’t). It’s a dwarf planet, and it’s smaller than the Moon. If all known dwarf planets were to be upgraded to planets there could be dozens of them. Eris gets no publicity but is 27% more massive than Pluto. Pluto is a non-asteroidal, non-moon, object orbiting in an eccentric manner around a star. It is not a moon, not a planet, not an asteroid, not a dead star, not an Oort cloud object, and technically does not exist because it is only defined by negatives. Like Ceres, it’s a dwarf planet. It’s spherical, but hasn’t cleared its neighborhood of objects not gravitationally bound to it. When discovered, Ceres, the largest main belt asteroid, was briefly considered a planet, until it was realized how small it is. Vesta would also be rated a dwarf planet rather than asteroid, had it not suffered a collision which knocked a big chunk off, spoiling its former sphericity. It’s about as small as you can get and still form a sphere. How do we know that Ceres hasn’t cleared its orbit of 99% of was originally there? The mass of objects in its path is proportionately orders of magnitude greater relative to its own mass than it is for true planets. There isn’t a hard and fast relative proportion in the definition, but the difference in this parameter between real planets and dwarf planets is so great that none is needed. What is the definition of orbit in this context? How many planetary diameters on each side of the planet have to be cleared, before an orbit is considered “cleared”? Everything in its orbit has to be gravitationally bound to the planet. When you reach the point at which objects orbiting the sun aren’t bound to the planet, then you’ve left the neighborhood. Hence, the size which matters is mass, not diameter. So Neptune is not a Planet, thanks to Pluto being an object that crosses it’s orbit but not being bond to Neptune. Consistency matters. Pluto don’t care about us or what we call it. It just is. The problem with Pluto is that there may be dozens of bodies larger than Pluto out there orbiting the Sun in the Kuiper Belt. We would have to add them all to the party. The excuse used to kick out Pluto in the first place was just a lame manufactured one. That may be true but Pluto is still the ninth planet we discovered. That cannot be changed. It doesn’t matter if it is a dwarf planet, it is still the ninth one humans discovered. No it wasn’t, since Ceres was discovered in 1801, not only long before Pluto in 1930, but also Neptune in 1846. But you’re right that Pluto and Ceres are both dwarf planets. Why differentiate between a planet and a dwarf planet? Is a dwarf human different to a human? or are they both humans? Hey, this is settled science. Pluto is not a planet. Are these guys planet deniers? Our children will never experience a 9th planet. There might be one out there. While it was considered a planet, Pluto was sometimes the 8th and at other times the 9th from the sun. 9th as in order of discovery. I thought you might mention that. But what matters is solar system astronomy is order from the sun, as in “third rock from”. The history of science, not so much in this case. Earth was only discovered to be a planet in the 17th century (although proposed by Copernicus in the 16th), long after Mercury, Venus, Mars, Jupiter and Saturn. So that makes us 6th in order of discovery. No, it makes Earth 6th in getting a particular label, It was discovered long before any of the others by virtue of the fact that everyone lives on Earth and thus “discover” it as soon as they are born. The fact is that there WERE 9 named planets and now there are 8. There will never be another 9th as long as the current definition is in place. What counts is the MEAN distance to th Sun. I would like to know if they have spotted any objects in Pluto’s orbit, other than Pluto’s moons. I would bet a paycheck they have not spotted anything, they are just guessing. So they don’t really know if this “rule” apples to Pluto or not. For that matter, Earth has not cleared its orbit of other objects, and we can spot those. Yes, we’ve seen lots of stuff in Pluto’s path, to include not just small, icy objects in the Kuiper Belt, but the planet Neptune. 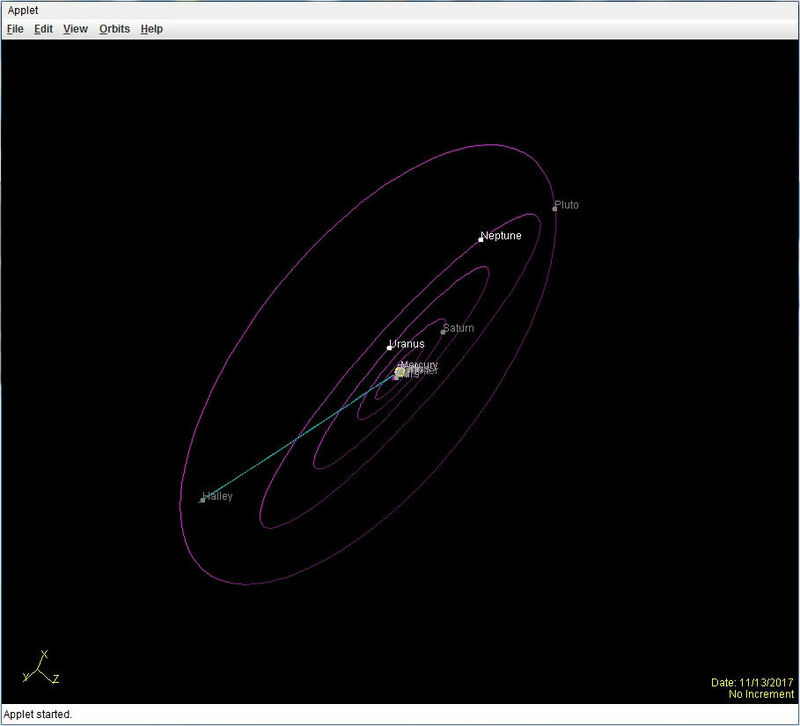 Pluto’s orbit crosses Neptune’s. The definition doesn’t mean that a planet has cleared all the mass from its path. It does mean that whatever is there is bound by the planet’s gravitation, such as moons and Trojans. There is also a difference in orders of magnitude as to the relative mass of the stuff in the path of a dwarf planet compared to a real planet. So, Neptune is a dwarf planet as well? After all you’ve just pointed out that it hasn’t cleared it’s orbit (there’s that Pluto object crossing it). As I said above, I don’t think anyone knows what is in Pluto’s orbit or whether it has been cleared or not, and would appreciate any information to the contrary. I think “clearing all the mass from its path” is a ridiculous, ambiguous requirement. It can’t even be defined properly, since all the planets are running into things in their orbits constantly. The Solar System is mostly empty space. There is no evidence that there are magnitudes more material in Pluto’s orbit than in the inner Solar System. Any information to the contrary would be appreciated. 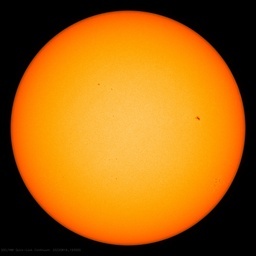 Again, it is not clearing all the mass from its orbit. As I’ve been at pains repeatedly to point out, “clearing its neighborhood” means that other bodies in its path are gravitationally bound to the planet. Thus, for example, Earth has cleared its neighborhood, but the moon resides there. The key point is that a planet’s mass is much greater than that of all the gravitationally bound objects along its orbital path. For instance, the moon is only slightly more than one percent of Earth’s mass, but that ratio is high for other planets. By you own words, neither is Neptune: ” Pluto’s orbit crosses Neptune’s”. So Neptune is not a planet either by your own arbitrary criteria. Not agreeing with this article. The only reason we consider Pluto so “complex” is because we sent a space probe there to look it over. Send another such space probe to, say, Eris (which is larger than Pluto and also has a moon) , and then get back to us. Eris’ composition is bound to be interesting. It’s denser than Pluto, being about 27% more massive, but slightly smaller in volume. That won’t change the fact that Pluto was the Ninth Planet to be discovered by Humans. It’s real simple: Let’s number the planets and dwarf planets by the order in which they were discovered. That won’t keep us from referring to various planets as dwarf or SuperEarth, and we give them names too, so it’s easy to distinguish between them. Making some other planet than Pluto the Ninth Planet is ridiculous. What matters in astronomy is objective physical reality, not history. Earth was the sixth planet discovered, but is third from the sun. We don’t know in what order the other five planets were discovered, but I’m guessing that Jupiter, Mars and Venus were noted before Mercury and Saturn. After Earth was recognized as a planet in the 17th century, then came Uranus in the 18th and Neptune in the 19th. But Ceres was considered a planet before Neptune was discovered, in 1801. Pluto was discovered in the 20th century, and, like Ceres, originally wrongly considered a planet, because it appeared much larger than it actually is, because Tombaugh couldn’t distinguish Charon from Pluto. Technically, Earth was the first planet discovered seeing as everyone lives on it. It may have been sixth to be called a planet, but it was discovered first. That is a definition of a planet in my book. Some moons have an underground ocean, a multilayer atmosphere, organic compounds and evidence of ancient lakes. Seven moons are also more massive than the largest known dwarf planets, ie Eris and Pluto. Sedna is probably a dwarf planet, possibly bigger than Eris. Yes but moons orbit other bodies. Pluto orbits the Sun. So too do an unknown number of other spherical objects. The FL astronomer wants to count moons and dwarf planets as planets, meaning that there are probably thousands of major and minor “planets” in the solar system. “Planet” then just means “sphere”. The Euler Diagram on the Wiki page for Dwarf Planets is missing an important box: Space Stations Just thinking ahead. They prefer to be called “little planets”. In the spirit of ‘Little Foot’ and his tree stars. Right. So every time we discover a new spherical Kuiper Belt Object, we’ll just call it a planet. Like Eris. And we’ll have dozens and dozens of new planets over the next few decades. And I guess Ceres will be a planet now. And what if we find a few giant comets out in the Oort Cloud that happen to be spherical? This “solution” is no better. It’s objectively dumber, in my opinion. How about Io, that Jupiter moon full of volcanoes? Isn’t it more active than Earth? According to the etymological dictionary, the word planet comes from the latin word planéta = to wander. A wandering star, as its track is different from other stars. So, since we can see Pluto from Earth, let’s keep calling it a planet. I love Pluto, my precious wanderer. It is comforting to know “The Science is Settled” …. until someone changes something. Indeed all it takes to change the settled science, apparently, is to arbitrarily change a definition. Sorry but this matter has already been settled by political science where the “progressive stack” determines which claims of victimization and due take precedence over which other claims. Here Pluto’s roundness works against it. It has “round privilege” which is trumped by the misshapen figure of Neil deGrasse Tyson. The progressive stack also assumes a fixed pie: to promote Tyson Pluto had to be demoted. There’s probably a kernel of truth to your last sentence. The kernel is the most important part. That’s what grows, in this case into a heap or pile. Maybe for sentimental reasons, I was brought up there were nine planets in the solar system, that Pluto should be considered a planet. Originally a planet was a moving object across the night sky. Mathematics, Newton’s theories and telescopes revealed Uranus and Neptune. He discovered Pluto. It orbits the Sun, is spherical,has an atmosphere and a moon. Ceres has no atmosphere. Further scientific endeavour has revealed the Kuiper and Oort belts. There are and yet to be discovered larger bodies than Pluto.. In my opinion they cannot be considered planets, unless the exceed the mass of Pluto and have an atmosphere. But to label hundreds of remote unobservable bodies with the epithet planet is ridiculous. So my definition of planet would be an orbit around the Sun, visually discernible (including optical telescopes) from Earth and spherical in general shape. Requirements of atmosphere or moons would preclude Mercury and Venus. Pluto can now come out from the doghouse again. During his lifetime, Tombaugh resisted attempts to demote Pluto. But after the IAU’s decision, his widow Patricia stated that, while he might have been disappointed with the change, her husband would have accepted the decision now if he were alive. It almost doesn’t matter, as there are no planets in nature. Just as there are no weeds. Having said that, I do agree that Pluto ought to be referred to as a planet. Good to see Pluto has been rehabilitated, a period of public self-denunciation after the show trial has ensured it only has politically correct thought now. An example objectively demonstrating that journal published studies are opinion pieces of varying consideration. That has always been the definition. It is only the 2006 IAU statement that attempted to change that. It think the whole reason for the new definition was to get public attention when Pluto was removed from the list of planets. Academia has become too focused on notoriety. “How I Killed Pluto and Why It Had It Coming” by Mike Brown (one of the co-discoverers of Eris). No. Pluto’s orbit is not coplanar with the eight known planets, and it actually crosses the orbit of Neptune. Furthermore, it has more in common with Kuiper belt objects than with the gas giants. It should therefore not be reclassified.
. . . it actually crosses the orbit of Neptune. No it doesn’t. If you look along the plane of the Ecliptic, you can see that Pluto’s orbit does not cross Neptune’s. The usual top-down view is misleading.